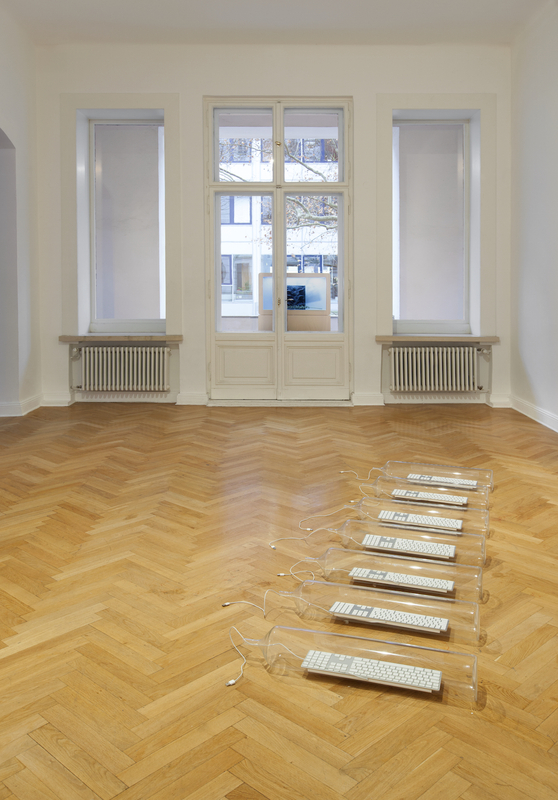 Pre-digital Space, Spiros Hadjidjanos’ second solo show at Future Gallery, examines the dormant nature of processes frequently perceived as automated and technological. Materials masquerade as processes, disconnected, and yet attain their full potential. 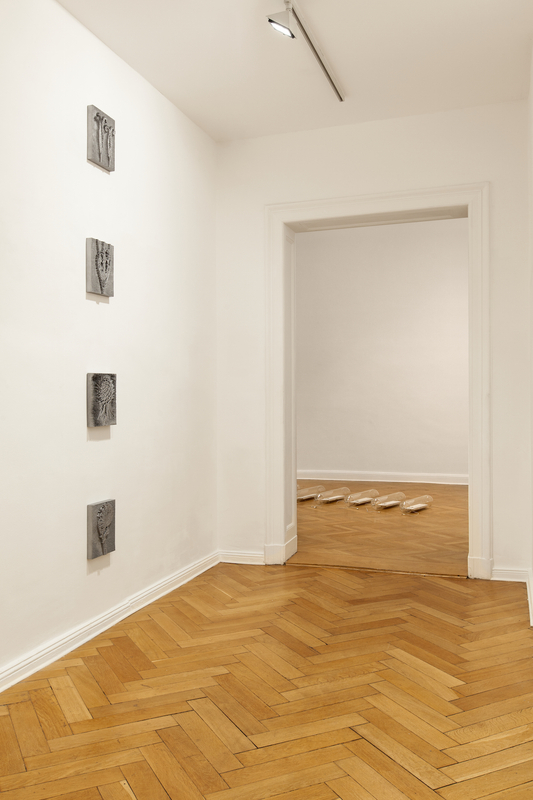 Excluding chronological interpretations in favor of spatial, the prefix in its title indicates the show’s aim to expose the substrate that makes the digital possible. 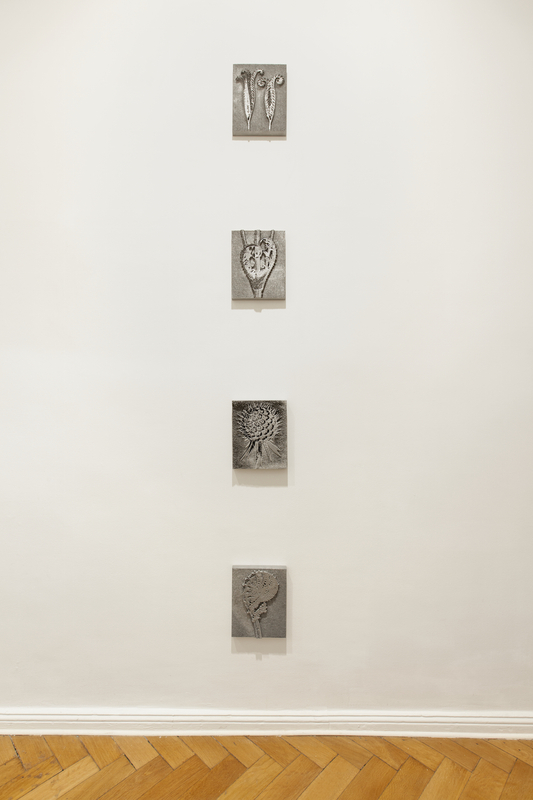 A selection of images originally published in Blossfeldt’s seminal book Urformen der Kunst forms the basis for a new series of 3D prints by Hadjidjanos. 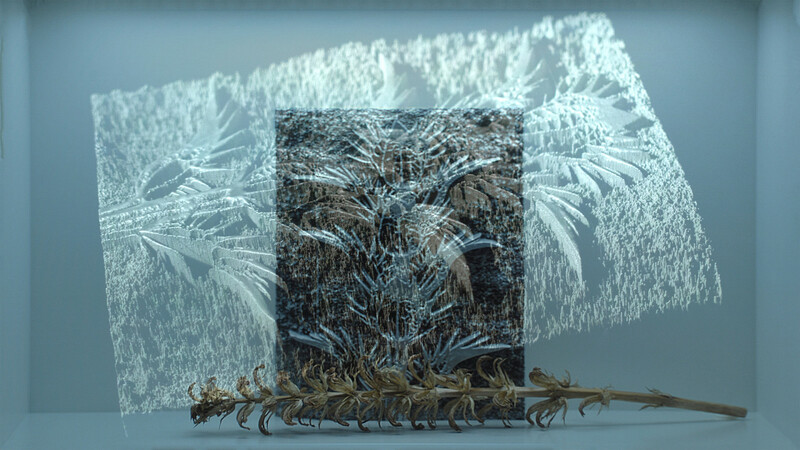 The works, titled after Blossfedlt’s plant motifs, were scanned from a 1928 first edition and printed according to the exact dimensions of the original photos with the addition of the third dimension, depth. 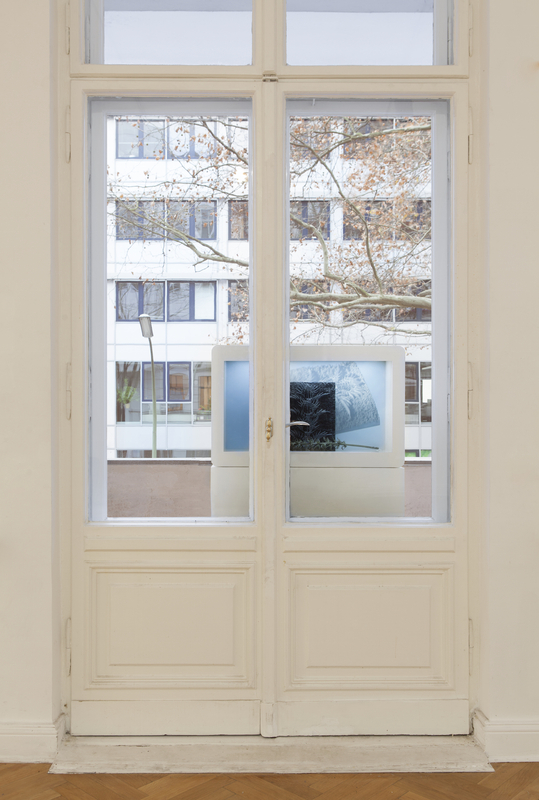 Their material, alumide, is a derivative of aluminium, the epitome of the streamlined aesthetic that came to represent modernity during the same epoch that Blossfeldt developed the anti-pictorialist approach of his photographic practice. Expanding upon the 3D print series is the work “Acanthus Mollis”. 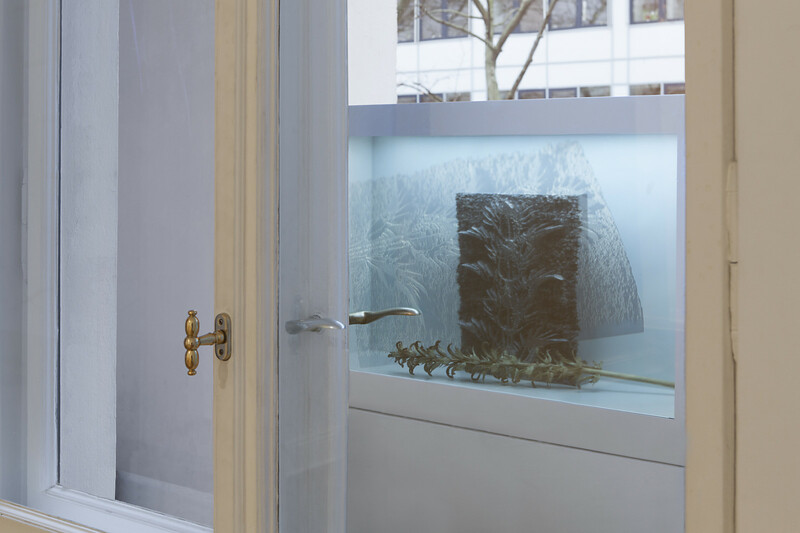 A sculpture depicting the Acanthus mollis plant is presented behind a transparent screen, and video footage of its reflection on a water surface is projected in front of the screen. 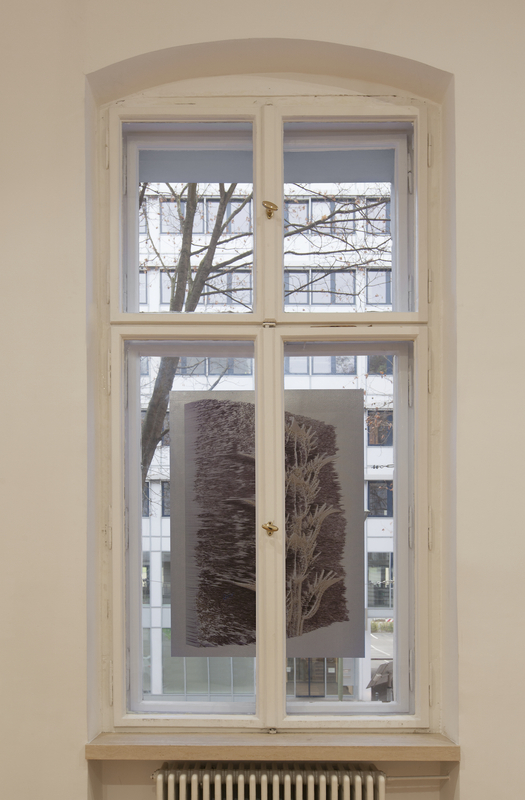 A dried Acanthus mollis collected in Athens is placed before the sculpture, generated by a scanned photograph of the same plant that Karl Blossfeldt collected in the Attica peninsula about a century ago. 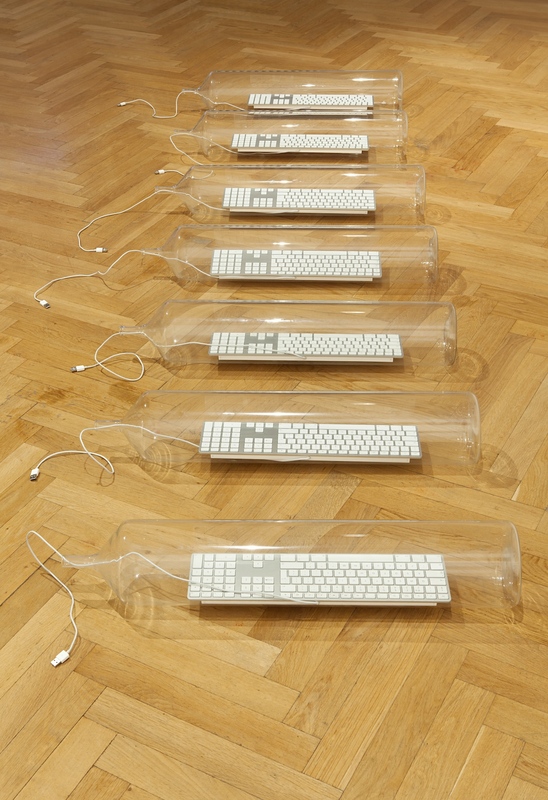 The work “Transmission in-itself” is an arrangement of seven used, functional Apple A1243 keyboards, each encapsulated in blown glass and therefore rendered useless. Due to their repetition their uniformity is foregrounded, and one might notice that the default languages of their keys comes from a member of the G7 group of countries. 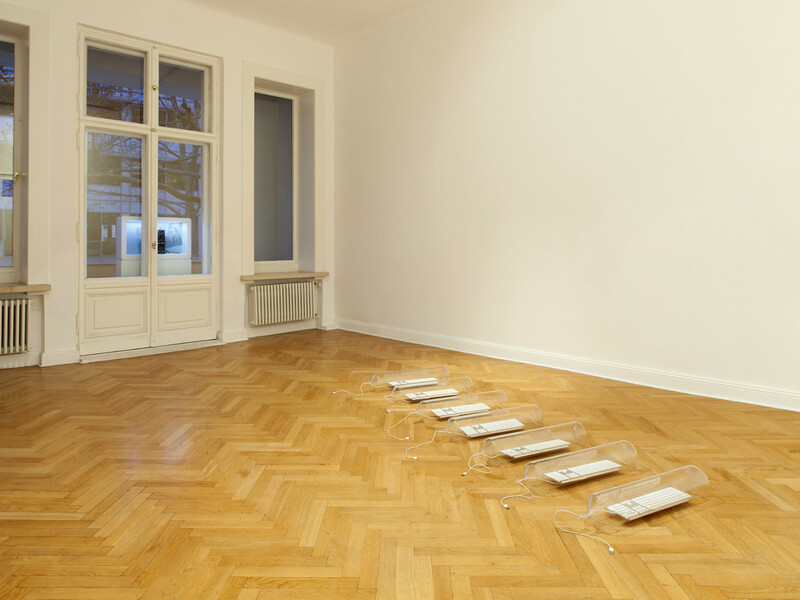 Their layout is a materialization of a political fact and an inherited tradition. 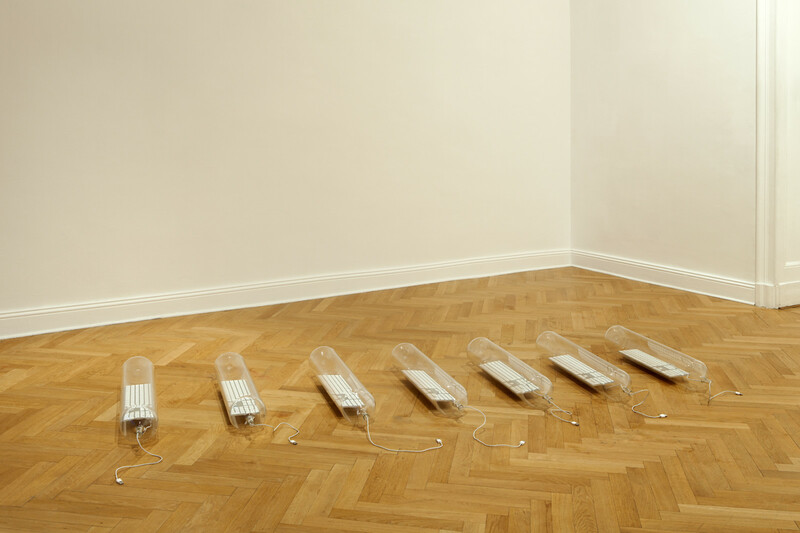 Metaphorically, through the glass, humanity’s epistemological limitations become clear; the access to the keyboards is only conjectural. 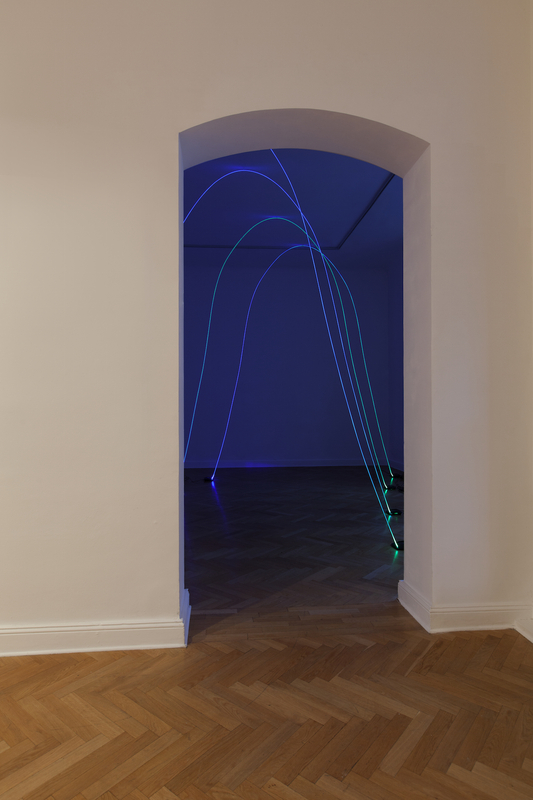 The final work, “Networked Gradients,” is a site-specific installation of four blue-green gradient curves of illuminated fibre optic cables by the LED light of wireless routers exposing the Internet as a material as opposed to a medium – a medium being the intervening substance through which impressions are conveyed to the senses. 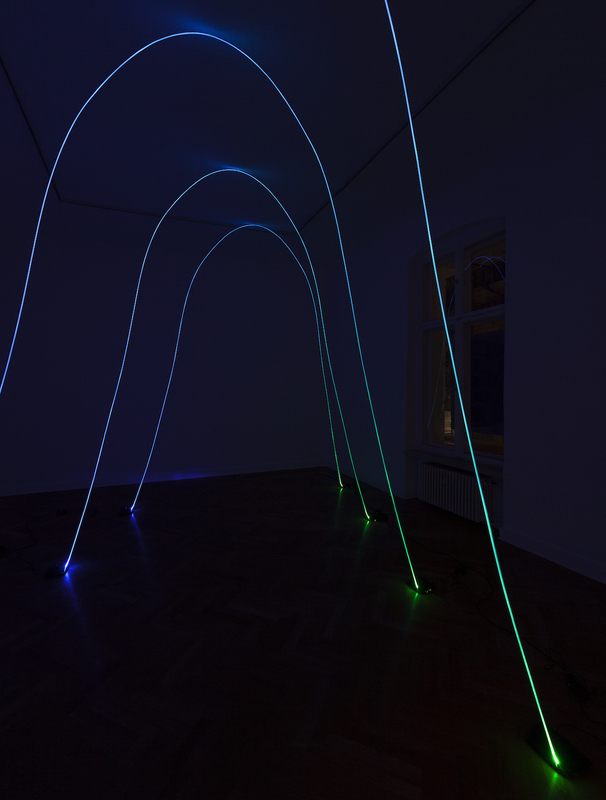 As a visualization of the node distribution in random networks, their shapes are reminiscent of mathematical Bell Curves adjusted to the architecture of the gallery space. 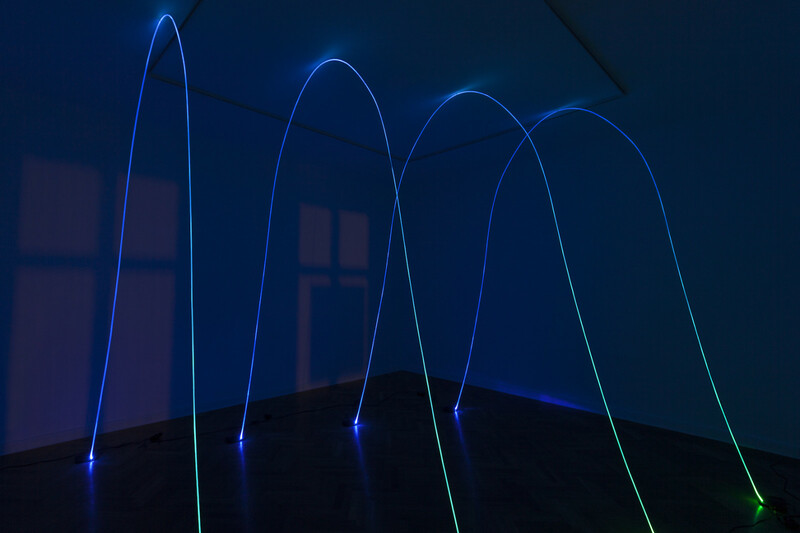 The Internet here is purely indexical, entering into perception only materially.